One week ago, I achieved a goal that had been several years in the making. In Antwerp, Belgium, I won the Toastmasters International Speech Contest for District 59, which comprises 18 countries in Continental Europe. I now move on to the World Championship Semi-Finals, which will be held in Cincinnati, Ohio in August. If I win my Semi-Final, I will compete in the World Championship of Public Speaking two days later. The road to the Toastmasters World Championship is long and tough and filled with its fair share of ups and downs. Every year, 30,000 people enter the International Speech Contest. We are now down to the final 88. (Reminds me of the Crazy 88 from Kill Bill!) The road has narrowed appreciably and it has just become a lot steeper! It was my fourth attempt at the International Speech Contest. On three previous occasions, I made it to District—finishing second twice—but always fell just short. Over the years, I had the good fortune to win the other three Toastmasters District-level contests (Evaluation, Table Topics and Humorous) but the International seemed to hover, tantalizingly, just out of reach. However, in Antwerp, things all came together. I felt good during the Semi-Finals on the Friday and better during the Finals on the Saturday. For a little over 7 minutes, I got to share a message I care about with 400+ people. They laughed, they cried, they were with me the whole time and I enjoyed every second of it. When the results were announced at the Gala Dinner, the applause was thunderous. When I finally made my way to the stage, I had to give an acceptance speech. It was quite emotional, but as I said then, the emotion had less to do with the actual winning than it did with my appreciation for all of the love and support and encouragement I have had throughout this journey from so many people. On 6 March 1981, Walter Cronkite, one of the greatest news anchormen ever, read the evening news for the last time. Growing up in southern Ontario, we would frequently watch the news from south of the border. As as young boy, I remember my parents, grandparents, aunts and uncles watching intently whenever Cronkite read the news. His retirement was a big deal in North America. During his final sign-off (which you can watch below), Cronkite said something which struck me at the time and which I remember to this day. Pay particular attention to the 10 seconds from 0:30 to 0:40. So it is with the person who wins a speech contest (or most any contest, for that matter). Yes, when a speaker is on stage, it is all up to him or her. Nobody can help. But, in order to make it to the stage in the first place, a speaker needs lots of help, lots of feedback, lot of encouragement and lots of support. Behind every champion are many others who have helped in some way. I have had tremendous support from so many people, so now it is my turn to say “Thank You”. To my wife, Julie and daughters, Alexandra and Kristen. For listening to these speeches over and over, and for your unwavering support of my pursuit of public speaking excellence. I love you more than I could ever express in a hundred speeches. To my parents; my sister, Karen and her husband, Bill; my brother, Greg and his wife, Amy. For all of the love and support and encouragement from the other side of the Atlantic Ocean. To the members of the International Geneva Toastmasters Club. A fantastic group of people. We come from all corners of the world and have a very successful club, with meetings regularly attend by 30 or more people. You have always given me great support and feedback whenever I have competed and it means so much. People like Bryan Johnson (Club President), Gerard Penalosa (Past President), Philip Selby (DTM and founder of our club), Ginny Rogers, Robert O’Riordan, Aziza Mohammed, Andrey Rogov and so many more. To Ben Parsons. Ben has been the heart and soul of our TM Club for many years now. He has been Club President, Area Governor and Division Governor (which covers all clubs in Switzerland). He has been a leader in many ways and he has been instrumental in getting others to step up and assume leadership roles. Ben has always given me great feedback on my performances. And he has also made sure that I keep things in perspective. I will always remember the final morning of the 2012 conference in Poznan, Poland where we shared a room. Like many others, we had been up very late at the Gala Dinner the previous evening. We were short on sleep and slightly hung over. I had won second place in the International Speech Contest and the trophy was on a table. When the alarm went off Ben got up, shuffled over to the table, picked up the trophy and read, “District 59 – International Speech Contest – Second Place – Poznan 2012”. He paused a moment and then said, “They should have written, ‘Second Place Again’.” Best line of the entire weekend! To Laura Penn. Laura is also a member of my club and the founder of a new club in Nyon, about 20 km from Geneva. In Antwerp, Laura won First Place in the Speech Evaluation Contest. It was her first time on the District podium; I am certain it will not be her last. Over the years, Laura has been a friend and competitor and she has forced me to be sharp from the very beginning of the contest season. No sooner had I advanced than she offered her help. She arranged for me to give my speech at her club in Nyon to help me practice for the Division Contest and gave me great advice on voice and gestures. 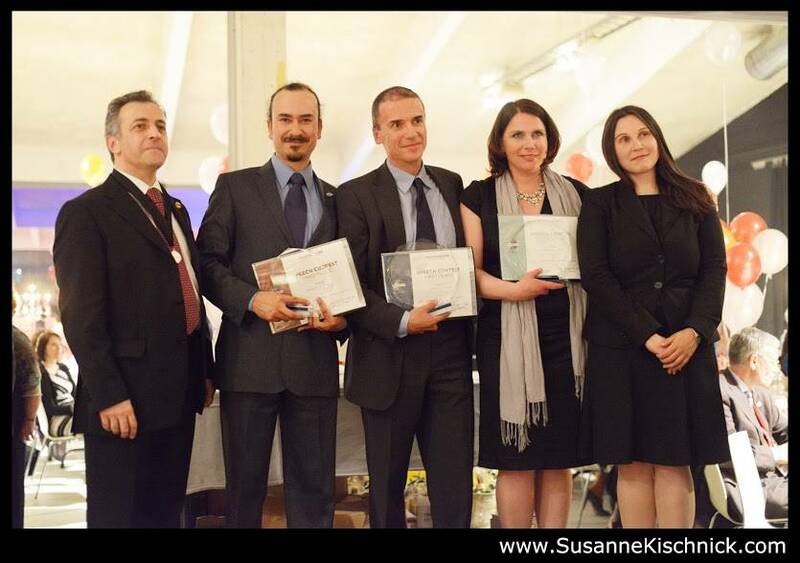 To the Toastmasters of Switzerland, Division E in District 59. People like Jack Vincent, Silvana Wasitova, Carina Schey, Thomas Skipwith, Mark Adler, Cindy Piccolo, Sandra Van de Cauter, Fouad Alame, Janene Liston, Douglas MacKevett, Keith Westmacott, Manuel Gomez, Natalia Filchakova, Marina Riedi and many more. 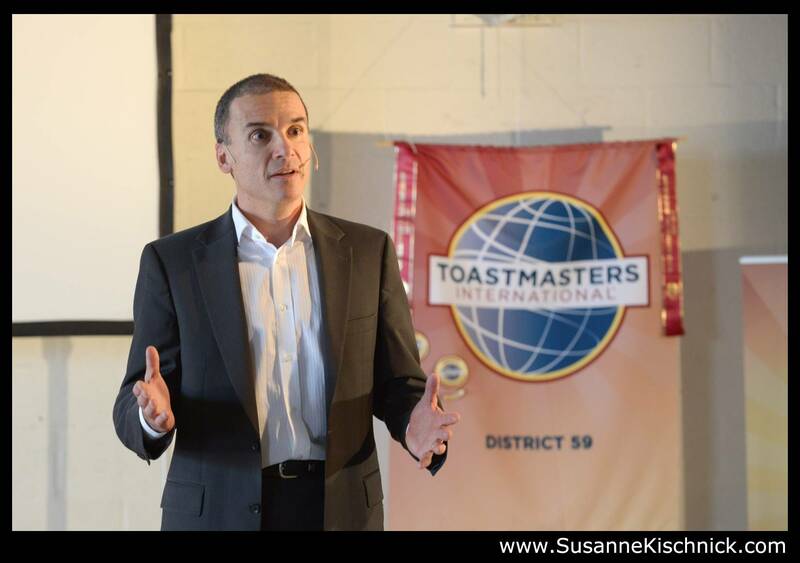 To the Toastmasters of District 59. We have an incredible District that covers most of Continental Europe. We stretch from Poland to Portugal, from Sweden to Switzerland and most places in between. I have had the good fortune to be able to visit clubs and attend events across Europe and I have always been treated with the utmost kindness. My thanks to people like Peter Zinn, João de Mendonça, Morag Matheson, Jerzy Zientkowski, Celeste Brown, Justyna Hołubowicz, Rui Henriques, Bill Monsour, Jorge Crespo, Peter Kenton, Tuire Vuolasvirta, Ana Maria Cunha and many others for all the support. Thanks also to Raquel Belo, Antonio Meza, Ibbe Mohammed, Christine Roos and Daniel Van Doorn, my fellow District Finalists, and all those who reached the District Semi-Finals, for a great contest full of outstanding speeches. Your excellence pushes me to strive for excellence. Bob Mohl. Bob is from the United States and lives in France. When it comes to speech-craft, Bob is a master. His insights and suggestions are always helpful. A past winner of the District International Speech Contest, Bob is a great coach. He knows exactly when and how to push a speaker and when to ease off. Florian Mueck. Florian is from Germany and lives in Spain. He is my partner with whom I developed the board game RHETORIC. In fact, it was Florian who came up with the idea and he invited me to come on board and work with him on the game. He is an incredibly generous person and has been a source of constant encouragement and inspiration. Olivia Schofield. Olivia is from the United Kingdom and lives in Germany. In 2011, Olivia reached the Finals of the World Championship of Public Speaking. She gave an incredible speech but went overtime and was disqualified. Many people think that but for those few extra seconds, she would have been the World Champion. Olivia sets a stage on fire and she has been so supportive throughout my contest run, offering great advice on staging and voice. Finally, a note of thanks to you, the readers of this blog. Your comments and support mean a lot and help me to stay focused and motivated. Looking ahead, my focus is now Cincinnati. The World Convention takes place from 21-24 August 2013. A little over three months to prepare for the Semi-Finals and (I hope) the Finals. The challenge is incredibly exciting and I look forward to it, especially knowing all the people who are behind me. Many of them appear in the wonderful video below prepared by the Organizing Committee of the District Conference in Antwerp. This entry was posted in Toastmasters and tagged speech contests, Toastmaster International, Toastmasters. Bookmark the permalink. Congratulations! You have been the inspiration to keep me active in Toastmasters. And I am thrilled to have you some time later here in Holland. As a humble suggestion to give you a hand in your preparation, I have mentioned in the email that I can get you in touch with World Champion of 2007 Vikas. He is a Shell colleague working in Houston. Let me know if you like this idea. Thanks very much, Wang. I very much appreciate it and I look forward to being able to visit your club at some point in the not-too-distant future. I also appreciate the offer to get in touch with Vikas and I have responded to you by email. Hi John, it’s Tara from China. Remember me? Congrats for the victory! I can really see and feel your effort and love to public speaking through your blog and that always encourages me a lot. Hope you great success in Cincinnati. Hi Tara! Thanks very much. Xie xie! I appreciate your good wishes. Congratulations from Vilma Bergstrom in Urbandale, IA – a silent fan (what are we called- lurkers?) of your website since 2011 when I first entered the Fall Humorous speech contest. I must have watched your speeches at least 10 times and have studied your transcript of “A Way Out” studiously for my own speech contest preparation. I was wondering if you had entered this year’s international speech contest- I was very happy when I learned that you had won your District! I have also been fortunate with my entry this year. I will be representing District 19 in Cincinnati! I hope I get a chance to say hi and thank you in person for this website and your videos. Better yet, I hope we get to share the same conference table as we draw for speaking order at the Finals! See you in Cincinnati! Thanks very much for taking the time to write such a thoughtful note. I am glad that you have found my blog useful. “A Way Out” is one of my favourite speeches (of mine). I had a great time delivering it and was pleased to have a forum in which to post my self-analysis. I have studied the speeches of many others, so it is always gratifying to hear when someone studies one of mine. Big congratulations on your own District win. That’s terrific. We are now officially part of the “Crazy 88”. I wish you the best of success in your Semi-Final and yes, it would be great to share the stage in the Finals. Let’s see! I look forward to saying hello in person in Cincinnati. I think, we would be competing in the same room for the semi-finals. I plan to watch your semi-final, miss the one after it then go onto mine: semi-final 9!!! It is so exciting and daunting at the same time. Indeed, it will be a full summer, especially given all the other obligations, but that is all part of the fun of it. If you are in Semi-Final 9, I don’t think we can watch each other as we will be on at the same time. Or did I not understand the schedule properly? Then we are on at the same time, unfortunately. But I am sure we will see each other there. Good luck to you too! Xenya a.k.a. The Green Stilettos Girl. Thank you very much, Xenya and thanks so much for adding my blog to your list. Much appreciated. I hope to make it out to Nyon again in the not-too-distant future and hope that our paths cross again. We will be “cheering” for you. Muito obrigado, Tulia! Much appreciated. Congrats Zim !!! – long way from Reach for the Top – Cincinnati? – come on – New York baby!! Thanks, Chris! Yes, Cincinnati! In previous years it was Orlando, Las Vegas, California; next year it is Kuala Lumpur. I get Cincinnati. But somehow, it just seems right. Thanks for thanks! We’re all really proud of you and sure you’ll be awesome in the semis AND the finals! A big thanks and a hug to all of you guys! We’ll see each other for sure this summer in Toronto. As a member of Paris Speech Masters I know Bob Mohl and Antonio Meza very well. I heard from them that the quality of speeches was outstanding. As a relatively new member in Toastmasters I am impressed by more experienced members and look to you all for inspiration, advice, and best practices and techniques. Congratulations on winning the district contest and wishing you best wishes as you prepare for the semi-finals. I hope to hear you sometime when you are in Paris!! Thanks very much for the message, Sean. You are fortunate to have great speakers (and people) such as Bob and Antonio in your club. You can learn an awful lot from people like them. But, at the same time, you cannot be like them or anyone else; you can only be yourself. That’s one of the keys to being a great speaker. I wish you well on your journey and hope that our paths cross some day. John, You were an inspiration since I first saw your YouTube clip – and decided to be better. I’m glad you are the person who inspires others. And yes, I hate you for giving me such a hard time trying to catch up with you :). Congratulations, John. Good luck in Cincinnati. Is the event open to the public? I live about 3 hours from Cincinnati and thought I might be able to drive down. Thank you for the wonderful post! 🙂 District 59 is proud of you! John, thanks for an amazing experience, both last year in Poznan and now in Antwerp. And congratulations! I keep my fingers crossed for you in Cincinnati. I know you can do it! Is your Antwerp speech going to be available somewhere? Thank you very much, Piotr. I really appreciate it. For now, I will keep the video of the speech offline as I will likely be using it in the Semi-Finals. But I will be sure to post it after the competition. I don’t know why your post reminds me of Julia Roberts’s Oscars acceptance speech – but it’s certainly fantastic. And you are fantastic too! Seneca said that, “Luck is when opportunity meets preparation.” You have the opportunity, and you’re well prepared! Go for platinum! Congratulations John!! How well deserved, when you share so much of your knowledge through your blog. As you say, it may have been several years in the making, but how very exciting to now be going to the US to compete! Congratulations John! What an accomplishment. Your Dad and I are so proud of you. Now wow them in Cincinnati! Congratulations John from Sydney Australia, well deserved. I love your consistent message spiced with a humanitarian understanding of the people and delivered with smooth logic, superb wit and riveting story telling. You have shared your gifts with us for some time now and we are much the better for it. I attended the District 70 International Speech Contest last night where a 21 yr old placed 3rd and am to introduce the 2011 World Champion Jock Elliot to a master class this Wed. So speech fever is here also. All the best for the next stage I will be following intently and wish you well. Many thanks, Chris. I can well imagine the scene in Australia. I had the good fortune to spend four days with Mark Hunter last year at our District Conference in Poland. Australia produces outstanding speakers. Congratulations, Mr Zimmer and very good luck in August! John, CONGRATULATIOMS! I wish you well at International!